The study, titled “100 kGy gamma-affected microbial communities within the ancient Arctic permafrost under simulated Martian conditions“, recently appeared in the scientific journal Extremophiles. The research team, which was led by Vladimir S. Cheptsov of LMSU, included members from the Russian Academy of Sciences, St. Petersburg State Polytechnical University, the Kurchatov Institute and Ural Federal University. For the sake of their study, the research team hypothesized that temperature and pressure conditions would not be the mitigating factors, but rather radiation. As such, they conducted tests where microbial communities contained within simulated Martian regolith were then irradiated. The simulated regolith consisted of sedimentary rocks that contained permafrost, which were then subjected to low temperature and low pressure conditions. To simulate Martian conditions, the team used an original constant climate chamber, which maintained the low temperature and atmospheric pressure. They then exposed the microorganisms to varying levels of gamma radiation. What they found was that the microbial communities showed high resistance to the temperature and pressure conditions in the simulated Martian environment. However, after they began irradiating the microbes, they noticed several differences between the irradiated sample and the control sample. Whereas the total count of prokaryotic cells and the number of metabolically active bacterial cells remained consistent with control levels, the number of irradiated bacteria decreased by two orders of magnitude while the number of metabolically active cells of archaea also decreased threefold. The team also noticed that within the exposed sample of permafrost, there was a high biodiversity of bacteria, and this bacteria underwent a significant structural change after it was irradiated. For instance, populations of actinobacteria like Arthrobacter – a common genus found in soil – were not present in the control samples, but became predominant in the bacterial communities that were exposed. Future missions could determine the presence of past life on Mars by looking for signs of extreme bacteria. Credit: NASA. This study was significant for multiple reasons. On the one hand, the authors were able to prove for the first time that prokaryote bacteria can survive radiation does in excess of 80 kGy – something which was previously thought to be impossible. They also demonstrated that despite its tough conditions, microorganisms could still be alive on Mars today, preserved in its permafrost and soil. The study also demonstrates the importance of considering both extraterrestrial and cosmic factors when considering where and under what conditions living organisms can survive. Last, but not least, this study has done something no previous study has, which is define the limits of radiation resistance for microorganisms on Mars – specifically within regolith and at various depths. This information will be invaluable for future missions to Mars and other locations in the Solar System, and perhaps even with the study of exoplanets. Knowing the kind of conditions in which life will thrive will help us to determine where to look for signs of it. And when preparing missions to other words, it will also let scientists know what locations to avoid so that contamination of indigenous ecosystems can be prevented. [/caption]I think that one of the most interesting questions that have been posed of late is ‘what is Mar’s atmosphere made of?’ There has been a great deal of study done on this topic and interest is increasing since the discovery of methane, a possible indicator of life. The Martian atmosphere has four main layers: lower, middle, upper, and exosphere. The lower atmosphere is a warm region(around 210 K). It is warmed by airborne dust(1.5 micrometers across) and heat radiated from the surface. This airborne dust gives the planet its ruddy brown appearance. The middle atmosphere is features a jetstream similar to Earth’s. The upper atmosphere is heated by the solar wind and the temperatures are much higher than at the surface. This heat separates the gases. The exosphere starts at about 200 km and has no clear end. It just tapers off into space. The carbon dioxide in the atmosphere freezes for part of the year and may drop to the surface. As much as 25% of the atmospheric carbon dioxide condenses at the polar caps into solid ice(dry ice) because the Martian poles are not exposed to sunlight during the planet’s winter. When the poles are again exposed to sunlight, the ice returns to its gas form and rises back into the atmosphere. So, a significant annual variation in the atmospheric pressure and atmospheric composition around the Martian poles. 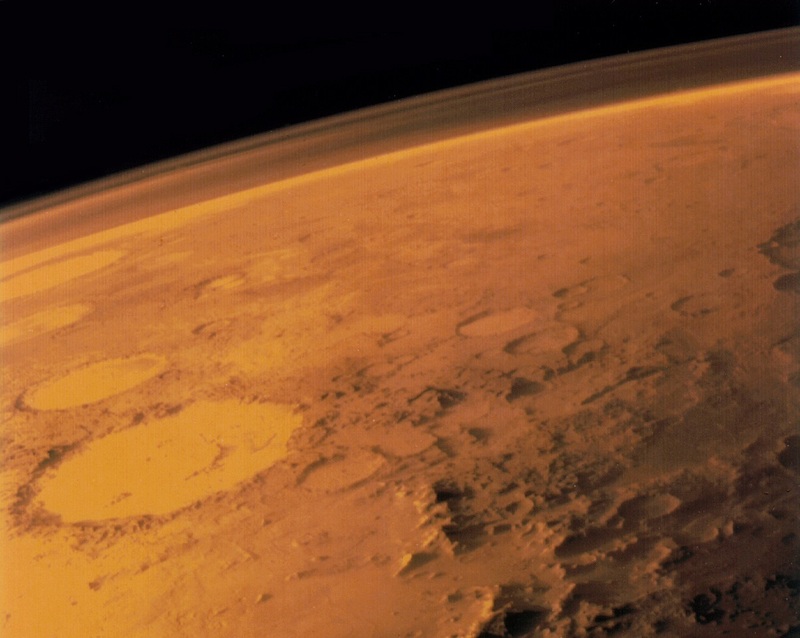 The methane mentioned earlier is used to show the possibility of life on Mars. While it is a byproduct of life, it is also a result of volcanism, geothermal process, and hydrothermal activity. Methane is an unstable gas, so there has to be a source on the planet that is constantly replenishing it. It has to be a very active source, because studies have shown that the methane is destroyed in less than on Earth year. It is thought that peroxides and perchlorates in the soil or that it condenses and evaporates seasonally from clathrates. Now you answer ‘ what is Mar’s atmosphere made of?’ the next time it comes up. You can be sure that the methane component will continue to be studied by rovers, orbiters, and, in the future, astronauts. We have written many articles about the atmosphere of Mars for Universe Today. Here’s an article about the air on Mars, and here’s an article about Mars’ comparison with Earth. We’ve also recorded an episode of Astronomy Cast all about Mars. Listen here, Episode 52: Mars.